Sawmil East Africa Ltd. had signed an agreement with the government four months back and have now begun operations in Rwanda. The firm produces high-quality wood for carpenters and construction companies. 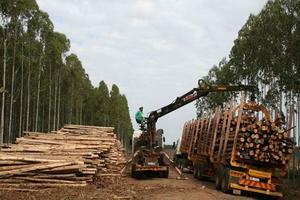 Sawmill East Africa signed an agreement with the Government to manage four state forests in a deal aimed at adding value to the forestry sector, help reduce the country's import bill on timber and promote exports. The firm has gained rights to manage, exploit and replant four forests in southern part of the country in Huye, Muhanga and Rusizi districts; and has already launched its initial operations in Muhanga in it's first phase of operations. Sawmill East Africa said that they have so far created more than 300 job opportunities. The firm is also tasked with maintaining environmentally friendly practices in the harvesting process as well as replanting of new forest to maintain forest cover. Officials say that creating synergies among stakeholders in the sector to maximise impacts of conservation efforts as well as forestation efforts are among their top priorities. Sawmill East Africa's Managing Director Agnis Magelinskas said that they have already established nurseries for new trees with the planting set to commence in the New Year. He said, "We have already started to build nurseries for growing young trees and are planning to plant millions of new trees at the beginning of the coming year. We believe that planting is very important for the new Rwandan generation to be able to enjoy plentiful and healthy forests, as well for the future wood industry, and we are determined to give our full attention to it". He remarked that as the first international firm in wood production in Rwanda, they are investing in innovative technologies such as natural chemicals for preservation, wood dying machines among other things. "We have already launched very powerful modern machines designed and adapted specifically to Rwanda's industrial needs and this region's wood type, having invested into the main focal point-speed and quality. In the future, we are planning to continue investments into machinery, people training and modern technologies," he said. The Government in 2016 estimated that forest cover was around 29 per cent, from 25.9 per cent in 2010. Rwanda has set targets of achieving a forest cover of 30 per cent of the total surface area by 2020. This means that at least 714,102 hectares are expected to be forest reserves with more than 107 small size forests across the country before the year 2020.